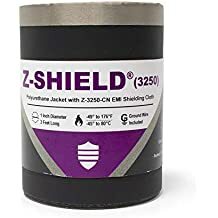 Hook It Tpu - Lightweight Jacketing - Wire And Cable Bundling - Products - ZT | Zippertubing Co.
0.5" 0.625" 0.75" 0.875" 1.0" 1.125" 1.25" 1.375" 1.5" 1.625" 1.75" 1.875" 2.0" 2.125" 2.25" 2.375" 2.5" 2.625" 2.75" 2.875" 3.0" 3.125" 3.25" 3.375" 3.5" 3.75" 3.875" 4.0" 4.125" 4.25" 4.375" 4.5" 4.625" 4.75" 4.875" 5.0" 5.125" 5.25" 5.375" 5.5" 5.625" 5.75" 5.875" 6.0" 8.0"
With the right procedures this product could be used in the medical field, including in hospitals, operating rooms, trauma centers, and emergency rooms. Protect your cables, wires, or hoses with Hook-It® (TPU), a complete halogen-free, flame-retardant solution. Hook-It® (TPU) offers the very best in cable, wire, and hose protection for those who demand a complete halogen-free solution. Having 20 mil thickness and easy re-entry with its aramid hook-and-loop closure, the Hook-It® (TPU) provides a complete 360° cable management protection solution that is convenient for any demanding environment. Not only is the product halogen-free, but Hook-It® (TPU) will withstand higher continuous temperatures of 275°F (125°C), which is significantly higher than limit for other flame-retardant cable and wire protection products. This provides a less hazardous environment by preventing the release of toxic halogens when overheated or in contact with fire. Although Hook-It® (TPU) is not specifically manufactured using a clean room in sterile conditions, with the right procedures it could be used in the medical field, including in hospitals, operating rooms, trauma centers, and emergency rooms. Fits cable diameters of 0.5" to 8"
Cable Diameter 0.5" 0.625" 0.75" 0.875" 1.0" 1.125" 1.25" 1.375" 1.5" 1.625" 1.75" 1.875" 2.0" 2.125" 2.25" 2.375" 2.5" 2.625" 2.75" 2.875" 3.0" 3.125" 3.25" 3.375" 3.5" 3.75" 3.875" 4.0" 4.125" 4.25" 4.375" 4.5" 4.625" 4.75" 4.875" 5.0" 5.125" 5.25" 5.375" 5.5" 5.625" 5.75" 5.875" 6.0" 8.0"
Introducing Zippertubing’s latest material offering for the medical industry, TPU. TPU, or thermoplastic polyurethane, is a flexible, high-temperature, halogen-free, flame-retardant jacketing film that offers excellent abrasion properties. This material, when used in conjunction with our other halogen-free materials, will provide a completely halogen-free and flame-retardant wraparound solution for virtually any industry or application. TPU is a flexible film that has excellent abrasion resistance, remains flexible through a wide range of temperatures, and can be RF sealed or sewn to other films, EMI shields, and closures, including our EZ-Track (TPU). This material is suitable for use in the medical industry due to its specifications and because of its clean white appearance. In the instrumentation and medical industry, failure and inaccuracy are unacceptable. Whether you need EMI shielding to ensure the proper function of machinery and equipment or cable bundling for safety regulations or cosmetic application, we have you covered. 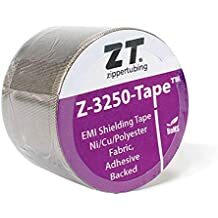 The Zippertubing® Company. American Made. Bundle. Shield. Protect. Material Thickness Variance +/- 0.005"
The Hook and Loop closure consists of dissimilar woven tapes comprised of synthetic hook filaments on one side and loop fibers on the other. The closure is sealed when the hooks are forced into the loops causing the hook barbs to engage and catch the loop side. The hook barbs can be pulled out of the loops numerous times with only minor damage creating a closure that can be re-entered and resealed. This closure system can be used with all EMI Shielding material options in Round, Flat and Rectangular configurations with cable sizes of 1/2" and up. No tooling is required to open or close this system. A spun Meta-Aramid sewing thread manufactured from Nomex® staple fibers. For sewing thermal barrier materials with excellent long term heat exposure, good seam strength and good chemical resistance. The thread shall have performance similar to the requirements specified in the Industry Specification A-A-55217A.